Since 2013 the specifications for Nascar set-ups have changed many times. Tony said many times that these set-ups didn’t mesh with his style of driving and he was struggling to find the right way to drive them from his perspective. But over the past few weeks, Tony and his Crew Chief Michael Bugarewicz have been improving the set up to fit Smoke’s style. 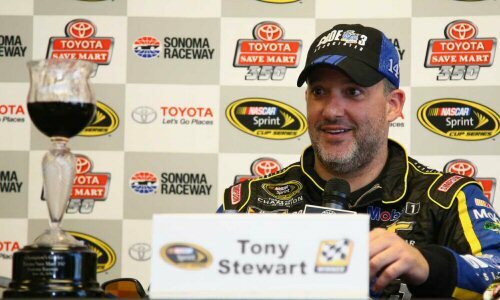 During his Press Pass availability after the Sonoma win, Tony said they finally figured something out at Pocono and it has carried forward to each race since. The #14Crew worked through the weekend tweaking the car and getting Tony into a 10th during the final qualifying run. He started the race and quickly moved to 8th before the first few laps were complete. A bad pit-stop put Tony back in the pack where he wasn’t able to move forward, even though he was running lap times equivalent to the leaders. Something drastic had to take place to get him back up in the top 10. Bugarewicz, also known as Buga; made a risky call and pulled Tony in for 4-tires and fuel. All they needed was a caution to benefit from the strategy. Something that has not worked out at all for Tony and his team this year. He returned to the field p32. But this time, NASCAR threw a debris caution. With all the leaders coming in, Tony and his #14 Chevy took over the lead with 20 laps to go. Lining up front next to Smoke was his old team-mate Denny Hamlin in the #11 Toyota. And behind them, Martin Truex Jr. who had also been running a very strong race during the day. Tony was able to hold off the field and hold the lead even though Denny was challenging. But Martin wasn’t done either. He and Denny began to battle for position and that allowed Smoke to put some distance between his lead and the two guys battling for 2nd. 18laps to go. Tony leads. Denny Truex KyleB and Carl holding 5th. Tony has run his fastest lap of the day! Then the Caution comes out for McDowell and the field bunches back up. During the caution Buga tells Tony on the team radio “Looked pretty good out there. Looks like they tried to dive bomb you. You at least having fun?” Tony replies with a bit of humor in his voice, “I’m trying. I’m not pissed off at this point of the race.”. 16 to go – Tony leads, Denny Martin KyleB Carl Joey Kevin DaleJr Kasey Newman JJ Kurt Larson Brad Biffle Jamie Blaney Menard Matt p19. Green with 14 to go, Tony gets a good start and Jumps way out in front, up the hill into the turn. 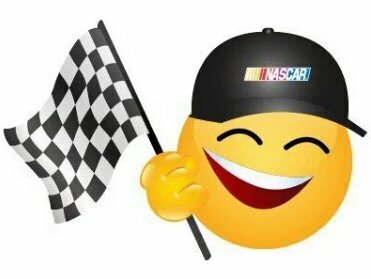 NASCAR reports the restart was good. Martin Denny and Carl are all fighting hard for position. That’s letting Tony get away. Truex still catching up. 12 to go. Truex makes contact with Tony. Denny gets up next to Truex and Tony gets away. 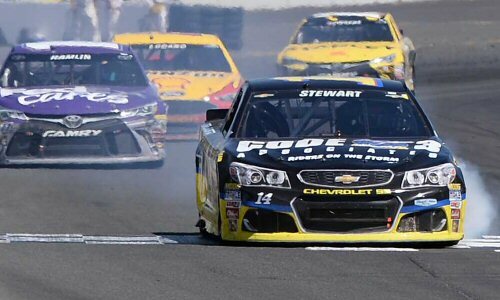 10 laps to go and @TonyStewart leads @RaceSonoma … It’s on @FS1 right now! During his Press Pass availability Smoke said he didn’t think they had a chance to win, but he thought they’d hold onto a Top10. On Lap 9 Denny gets around Martin and takes p2. 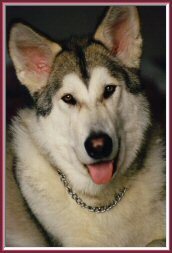 He begins to start closing the gap to Tony. 6 to go. Denny is now 1.3seconds back from the leader. Tony still holds 1st place. Buga radios to Spotter Bob and relays his hope that Tony is saving his stuff and not pushing it, because Denny is gaining. 4 laps to go. Tony leads by only .6 seconds over Denny. As the #11 gets closer, Tony starts pushing again, he was indeed saving his stuff. 2 to go Tony gets back out to 1.0 second in front of Denny. White flag comes out, 1 lap to go. Tony wheel hops and that allows Denny to get on the inside of the turn and he takes the position from Smoke. 2 corners left to the checkered. Turn 11 and Denny wheel hops this time, Tony gets on the inside. They make contact, Denny slides to the outside wall and hits the rear hard into the barrier. Tony also has damage to his left rear but both keep going. Tony crosses the line and takes the checkered. Tony wins and breaks his winless streak! 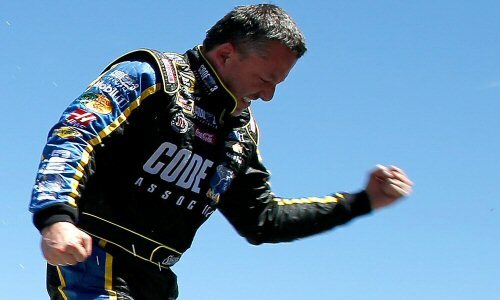 Tony Stewart Takes The Checkered Flag. They Don’t Call Him Smoke For Nothing! Twitter blows up with cheers and congratulations from other drivers from USAC, WoOutlaws, IndyCar and more. Tracks are tweeting their congratulations, retired NASCAR drivers and drivers from the other NASCAR series. It was one of the most popular wins as teams came to the outside pit wall to congratulate Tony as he drove past on his way to Victory Lane. 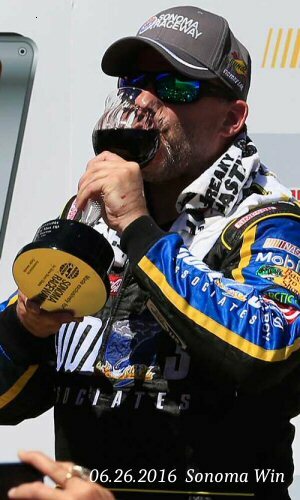 The “People’s Champion,” as he is known among NASCAR fans, received congratulations and tweets of joy from fans of other drivers as well as his own. His father, Nelson Stewart, was still wiping away tears while watching his only son celebrate in Victory Lane. His mom, Pam Boas was also there showing her emotion and support as well. Thanks to Pitwall Productions for posting this on YouTube! Tony said he was most grateful to earn Buga his first Sprint Cup Series victory and to see his crew “who have stuck with me” celebrate in Victory Lane emotionally charged up and downs. Congratulations Tony on your return win!